Wallpaper Installation in bathrooms? 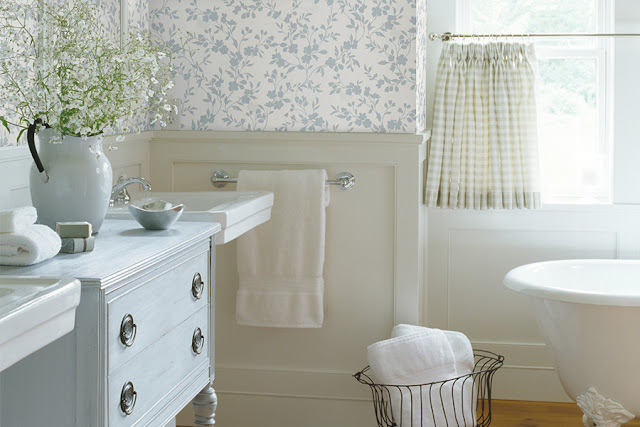 With care and good ventilation any wallpaper can be used in the bathroom. You just need to make sure it doesn’t come into contact with water on a regular basis. So not directly around the bath, shower or sink – otherwise anything goes. Whilst tile effects remain popular we hope we can show you here some of the more recent trends for bathrooms. Black and white is always a classic, combination for bathrooms. Black wallpapers work perfectly to add some drama and sophistication to a plain white bathroom suite. Pretty florals, give you instant country appeal and of course are perfect for co-ordinating with towels and toiletries as these pink examples show, but you could as easily choose, orange, blue, green. Ideal perhaps for a guest bathroom, so let your heart rule and say it with flowers. These animal print and faux effects are just perfect for bathrooms, adding a textural feel and look, which contrasts pleasingly with thick, heavy luxurious towels and delicately scented toiletries to create the perfect, chic, boutique hotel effect.